Gold softened overnight in a range of $1185.55 - $1191.40, continuing to trade against movement in the US dollar and in very similar price action as the night before. 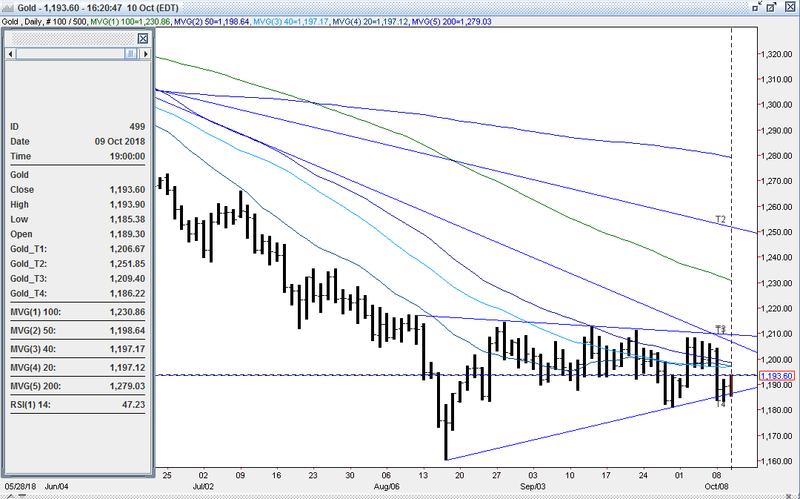 Gold ticked up to its $1191.40 top during early Asian time, helped by a pullback in the DX to 95.54. The greenback was pressured by strength in sterling ($1.3131 - $1.3184) and the euro ($1.1483 - $1.1515) - with optimism of a Brexit deal still resonating – along with some dovish comments last night from the Fed’s Evans (no signs that inflation could rise too much), and comments from US Treasury Secretary Mnuchin warning China on yuan devaluations. Later during European time, gold slid to its $1185.40 low, as the DX advanced to 95.79. The dollar was boosted by a pullback in the pound ($1.3136, misses on UK GDP, Construction Output, and Construction Output) and the euro ($1.1483). Global equities were mixed with the NIKKEI up 0.1%, the SCI was +0.2%, European markets ranged from flat to -0.4%, and S&P futures were -0.1%. Oil prices were modestly higher (WTI from $74.57 - $75.06, 40% of US Gulf output shut for Hurricane Michael) were supportive of stocks. At 8:30 AM, Core PPI excluding trade was stronger than expected (0.4% vs. exp. 0.2%), and lifted the US 10-year bond yield to 3.244%, and the US 2-year yield to 2.096% - a 10-year high. 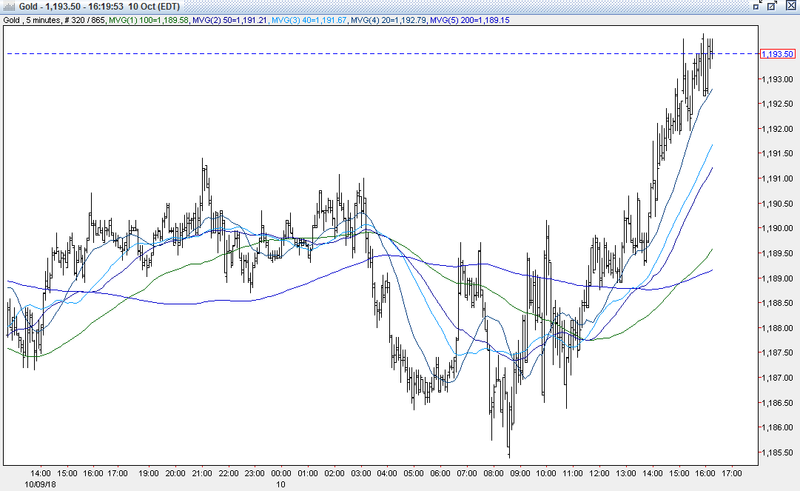 The DX, after a dip to 95.63, jumped back up to 95.76. Gold, which had bounced to $1187 on some dip buying, fell to a new low at $1185.40. US stocks sold off sharply on their open, with the S&P shedding 50 points to 2929 by mid-day. Concerns of higher interest rates continued to spook equity investors as the IT and industrials sectors led the decliners, and a tumble in oil (WTI to $72.89, demand concerns) contributed to the drop. This was despite some dovish commentary from the Fed’s Evans (wages are up, but not up by as much as you might expect, little more to go before reaching neutral rate of 2.75-3%). 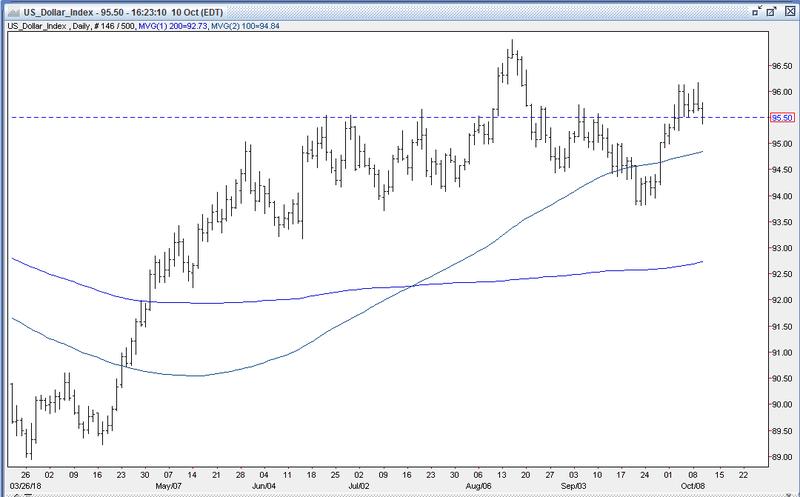 The US 10-year yield slipped back to 3.21% (safe haven buying of bonds), and the DX retreated to 95.37. The DX was also hurt by strong recoveries in the pound ($1.3213) and the euro ($1.1545) as EU chief Brexit negotiator Barnier confirmed that 85% of a deal is agreed. Gold rebounded – albeit modestly – topping out at $1190. Into the afternoon, the US 10-year yield moved back up to 3.242%, tripping another leg down in US stocks. The S&P fell to support at 2823, just in front of its 100-day moving average at 2822, with the IT, Industrials, Energy sectors off more that 2.5% each. 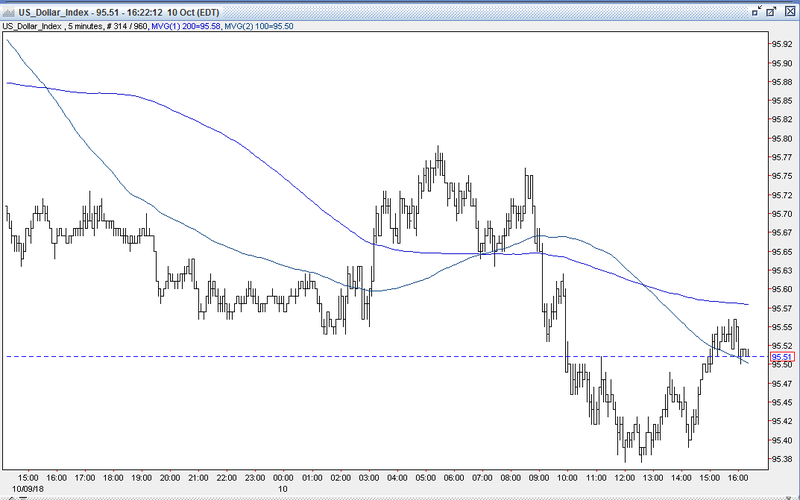 The DX hovered between 95.38 – 95.50, and gold clawed higher. The yellow metal rose, but still sluggishly, as rally attempts were met by selling from other participants trying to raise capital. Gold reached $1192.40, running into resistance at yesterday’s high. Later in the afternoon, losses in US equities accelerated, with the S&P finishing off 94 (3.3%) to 2786. The 10-year yield pulled back to 3.199%, while the 2-year yield slipped to 2.865%. The DX ticked up to 95.56, and gold clawed up to $1193.90. Gold was $1193 bid at 4PM with a gain of $4. Open interest was off 5.2k contracts, showing a combination of early long liquidation down to yesterday’s $1183 low, followed by some short covering later in the session. Volume was lower with 252k contracts trading. Bulls will take today’s modest $4 gain in gold, but were disappointed that given the sharp selloff in stocks and the pullback in the DX, that gold couldn’t advance further. Other bulls know that gold often gets sold to raise capital when equity markets are under stress, and will use the relative weakness opportunity to get long(er). Bulls point to the market again finishing above $1187 (50% retracement of up move from 8/16 $1160 low to 8/28 $1214 high) and $1185 (up trendline from 8/16 $1160 low) – key support levels to keep some bullish technical arguments alive. Bulls remain steadfast in their thinking that gold bottomed at $1160 on 8/16 after a $35 2-day capitulation, and will look to continue to add to long positions on weakness, or on some expected ensuing upside momentum. They maintain the market has been and remains extremely oversold - having dropped $205 (15.0%) since the 4/11 $1365 high, and $149 (11.4%) since the $1309 high on 6/14. Bulls strongly believe that the dollar’s rally was badly overextended, and expect its correction from the 8/15 96.99 high (up 9.90% since its 88.25 low on 2/14) to continue, and drive a significant short covering rally in gold. Bulls are looking for gold to retest initial stubborn resistance at $1207-09 (10 tops, 8/29, 8/30, 8/31, 9/6, 9/12, 9/14, 9/20, 10/2, 10/3, and 10/4 highs, down trendline from 4/11 $1365 high) followed by $1209 (down trendline from the 8/10 $1217 high), $1213-14 (triple top – 8/13, 8/28, and 9/13 highs) and then $1216-18 (5 tops, 8/6, 8/7, 8/8, 8/9 and 8/10 highs). Beyond this, bulls are looking for a move to at least $1262 – the 50% retracement of the move down from the 4/11 $1365 high to the 8/16 $1160 low. In addition, bulls maintain that Friday’s Commitment of Traders Report showing the large funds added to their net short position (now 22k contracts net short - turned short 7 weeks ago for the first time since 2002) and with a massive gross short position (214k contracts –short side of gold an extremely crowded trade) leaves this market set up in a highly favorable position to move up from potential heavy short covering and sidelined longs returning to the market. Bears are trying to remain patient, selling into any strength to re-establish / add to shorts, but some shorts are getting anxious with gold’s recent resiliency and ability to hold / recover above key support levels. Other bears remain confident that this market will trade significantly lower - believing that gold’s recovery rally ($1160 - $1214) has been completed. They point to its repeated inability to take out the $1214 double top (despite some bouts of dollar weakness) and repeated violations of up trendlines from the $1160 low on 8/16 as evidence that the yellow metal will continue its decline. This is witnessed by Friday’s COT Report showing the large funds added to their net short position and have constructed a hefty 214k gross short position. Bears feel fuel from dollar strength, higher interest rates and soaring equities will continue to provide downside pressure on gold. They will be gunning for stops below $1181 - 84 (7 bottoms - 8/20, 8/23, 8/24, 9/27, and 9/28 lows) to lead to a test of $1175 (options strike) and then $1171-73 (quadruple bottom – 8/15, 8/17, 1/6/17 and 1/9/17 lows). All markets will continue to focus on geopolitical events (especially Brexit developments), developments with the Trump Administration (especially on US-China trade, potential legal issues), oil prices, Q3 corporate earnings (begins Fri), and will turn to reports tomorrow on US CPI, Jobless Claims, and Oil Inventories for near-term guidance.